Ambigram tattoo is an exclusive type of tattoo in which the letters or figures are created in a distinct way for making it readable both right side up as well as upside down. It is a wonderful piece of art and has gained extreme popularity among today’s tattoo-lovers. In this article, we have compiled a list of 15 best Ambigram tattoo designs with pictures and meanings which definitely rock you. 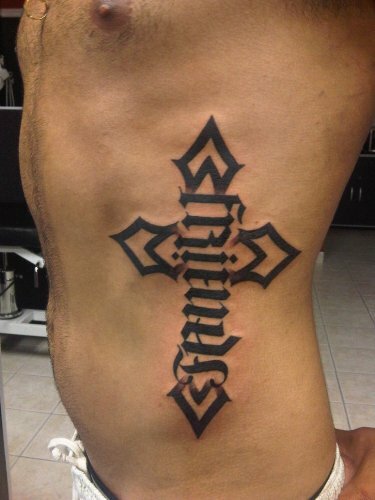 For the people who like to be a little spiritual and do believe in God, this cross ambigram tattoo is almost perfect. You can get a word done in the way of a cross so that the middle word becomes the common one and like a crossword puzzle you can read this word from all sides. It is extremely stylish as well as common. You can also get this one done in any size and on any part of the body. Cross designs are anyway very popular tattoo designs and something like this is sure going to be very uncommon. 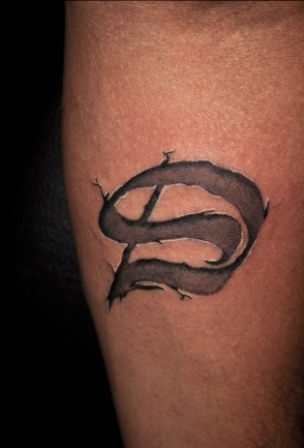 It is one of the best ambigram tattoo designs for men. This is one quote that you should always remember throughout your life and this is going to help you a hundred times. This is also one very good ambigram tattoo designs and it simply means ‘take the opportunity’ or ‘grab the chance’. This is of course extremely important for us to welcome all the opportunities no matter how big or small they are to make the most of these. We simply never know what can give us happiness. No matter how old you become the love for your mom and dad will never decrease in your heart. It will in turn increase and since we can never thank our parents enough for whatever they have done for us, some of the best ambigram tattoos make our work really very simple. 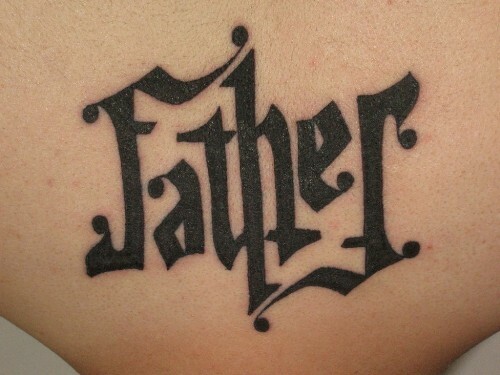 You can either get some quote inked but when it specifically comes to ambigram, a single word is a better option and getting the words ‘mother’ or ‘father’ inked on your hands or neck can be really thoughtful. You can get this done as a birthday gift for your mom and dad and their expressions are sure to be priceless. 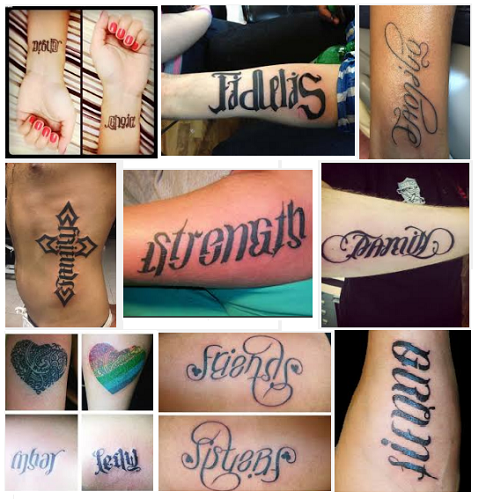 While choosing from ambigram tattoo designs it is often see that we tend to choose the first letters of names or the usual one word motivational ones such as love, life, faith, family and all. 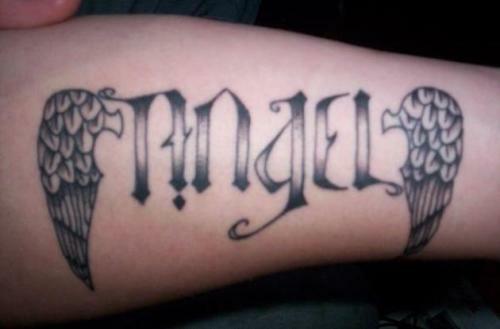 Let us now do something different and thank our guardian angel by getting inked with the word ‘ANGEL’ in a beautiful font and also elaborate the whole thing with typical angel wings. You can cover the whole front portion of your hands from the inner joint to the wrist with this design. Some people find inking an entire name on their skin in ambigram quite boring. They love to make it more mystifying by discarding all other letters of the name except the first one. If you also want to keep it short and sweet, just get the first letter of your name tattooed on your skin in ambigram. 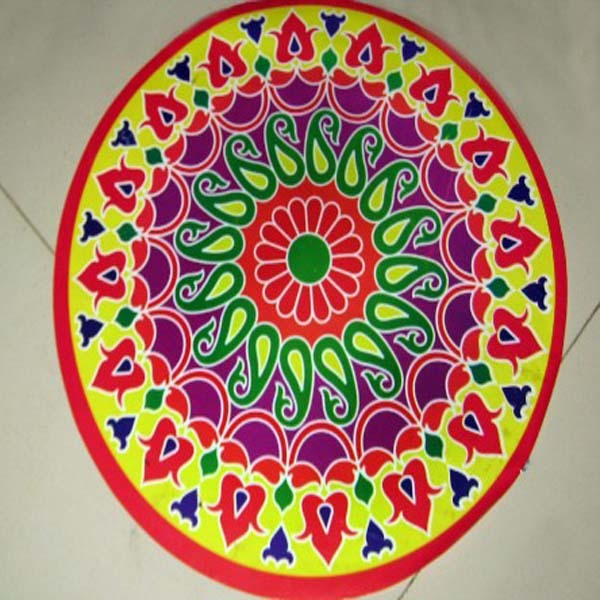 Add some shades or a beautiful design to it for more intense effect. ‘Life’ is the most precious thing that we have been gifted by the God. 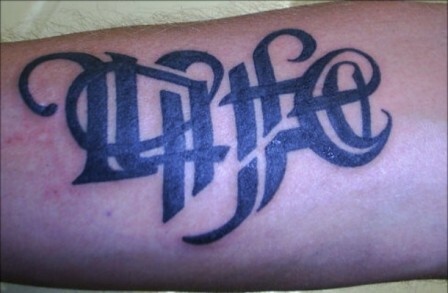 If you want to celebrate your life and live it to the fullest, get a tattoo of it in ambigram. The word inked on your skin will keep reminding you how beautiful your journey of existence is and how much thankful you are to the God for this. Love is the most beautiful feeling experienced by human beings. 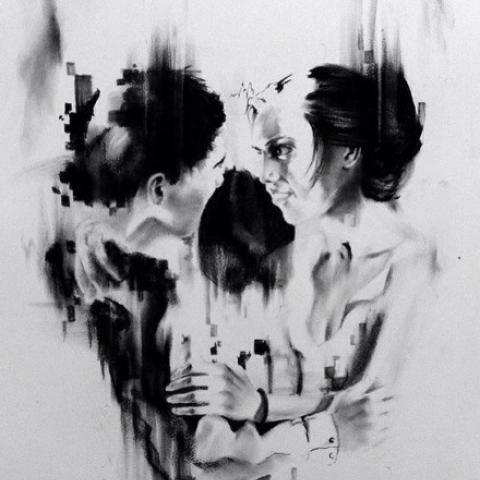 Whether it refers to a familial emotion or a romantic sensation, it has a deep and vast meaning always. 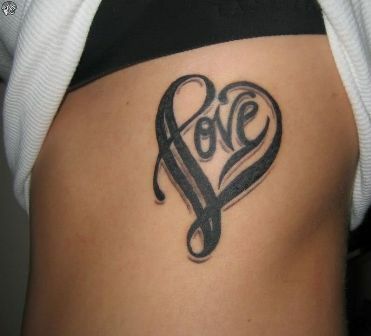 So, go for a tattoo showcasing the word ‘love’ on your skin in ambigram. It would not only work as a medium for spreading your love but would also make you feel up on those gloomy days. This is one of the popular ambigram tattoo designs for women. 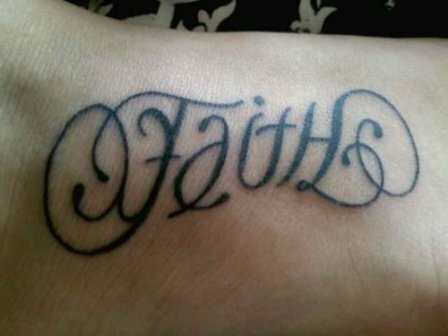 An ambigram tattoo displaying the word ‘Faith’ is also very common among today’s’ generation. 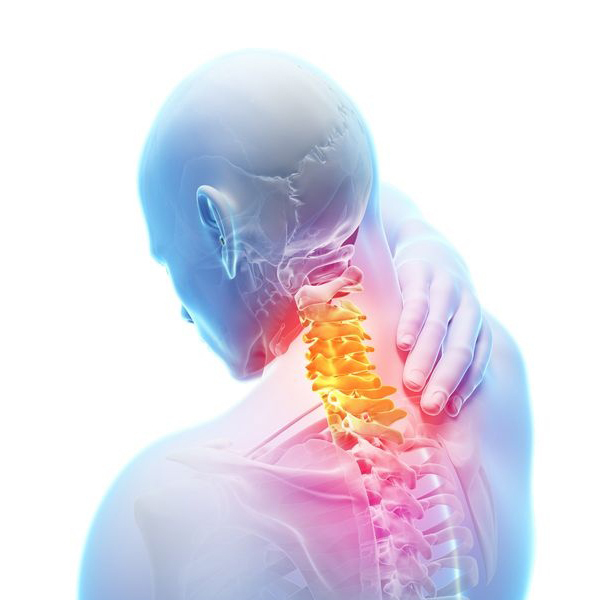 It doubles up the self-confidence of the person and pushes him her to reach particular goals. Being a word with very strong meaning, it serves as a lesson to people and boost their faith on themselves. 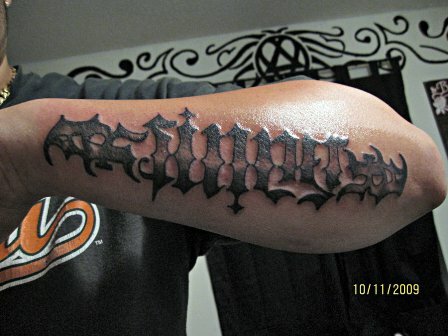 Nothing can be as good as getting a tattoo designs depicting your best achievement in ambigram. It has become quite popular now. Let others know how much effort you had to put for accomplishing that. It can always give you a wonderful feeling. Our zodiac signs say a lot about us. 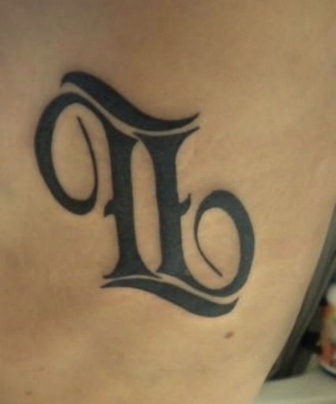 Hence, lots of people like to get their own zodiac signs tattooed on their skin in Ambigram. It is undoubtedly an exceptional concept and gives us a smart as well as contemporary look too. If you also feel proud to be a passionate Leo or a protective Taurus, do not miss the chance to show it to the world through your tattoo. Not a single person likes to study when they are small but as we grow up there are certain subjects which absolutely engross us and we love to read books on them. How about keeping the essence of these subjects with us forever and expressing our love towards them? It is a great way with the help of ambigram tattoos. You can get it done especially on your right hand or anywhere else as of that matter but do it in a broad way to make it look more prominent and beautiful. Those who love three-dimensional tattoos can add a twist to their style by choosing an Ambigram with three-dimensional effects. 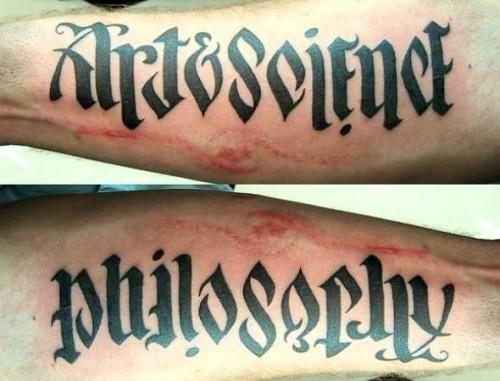 These 3-D Ambigram are not only a great sort of body art but they also look highly realistic. So, if you are looking for something different that would make your tattoo stand apart from those of your friends, choose it without any hesitation. If you want to go one step further, opt for a face Ambigram. However, creating the face of your desired person perfectly on the skin might be a bit difficult. Hence, most people try to get something done, which symbolize their personalities. It can be a general face with certain features that you admire or simply the face of an angel or a devil. If you are a person of mixed personality, go for a face that has an angel and a devil on either side. 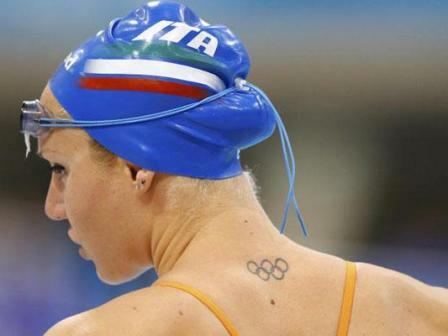 What can be more exciting than getting a tattoo that reflects your own identity? Yes, you can write your name as a tattoo and celebrate your existence in a unique way. In fact, this is known to be the most popular design for an Ambigram tattoo. 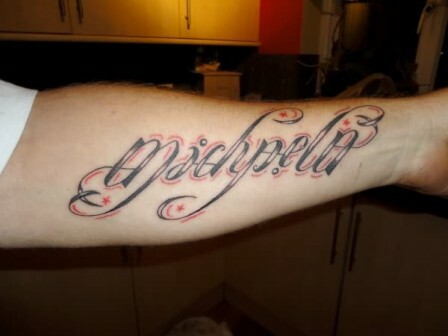 If you wish, you can also get the name of the most lovable person of your life tattooed in Ambigram. Adding vibrant colors to them would even double up the fun. 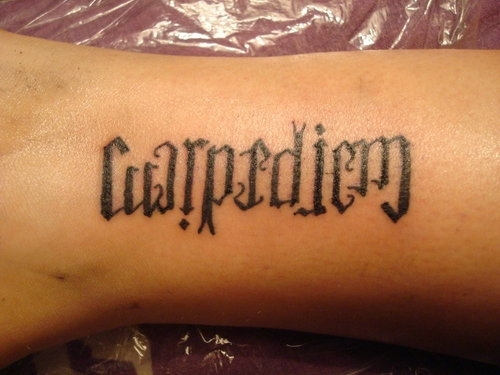 This is one of the coolest ambigram tattoos and can be done on anyone be it a male or a female. You can get such animals faces done on a broad portion of your body and make it done in a way so that it does not look very grunge. 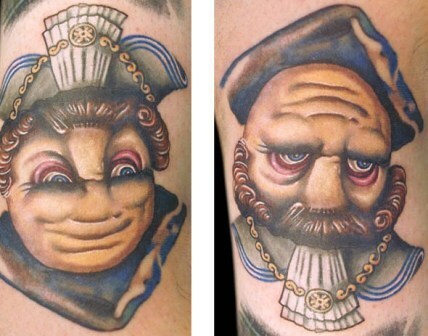 Now you can see the magic with the ambigram effect where you will find animal faces from both the sides of the tattoo. Extremely stylish and extremely fashionable this one this! When tattoos have become a rage, people are looking for newer and newer designs and these ambigram tattoos are great ideas. So if you are planning to get a tattoo done get one of this kind very soon.